Summary: Kristen McGuiness is a recovering addict who finds herself at age thirty to say phooey to fate and made a decision to find a man to be her mate by inserting herself into 51 dates in 50 days. What turns out is that every date she goes on is not just with potential marriage material; she sets dates with her mother, her father, her uncle, a spiritual advisor, even a horse. This entire plan becomes a journey of self-discovery in order to increase her perspective on life and love as a sober woman. Her con nection to men stems from her relationship to her father and his issues. Because of this, Kristen is more aware of what she is attracted to and why than some people. Now she tries to find out how to stop the cycle by improving herself and her situation while also dating men and seeing how they differ and relate to her internal struggle. Review: Ever pick up a book and think “hmmm…” this sounds interesting? Ok. That’s a dumb question for readers. But here’s one that I found and wasn’t sure if it was the title, the cover, or the content that grabbed my attention. 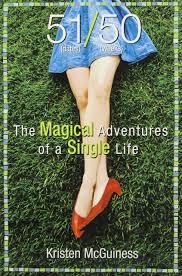 “Magical Adventures” and “Single Life” made me think it could relate to me and thought that perhaps it was a how-to book. The cover was cute. So I snagged it. What lay inside was an interested sort of journey for one young lady in sobriety and love with a slice of reality. The complexity of this story is woven fairly well and I enjoyed most every moment of it. There were times I literally shook my head or groaned in disgust with her choices. But these are her choices to make and her mistakes to be made. Admittedly, I had a difficult time getting through the book because Kristen isn’t the type of person I would associate with in real life. Her character is so shallow and pedantic that I wondered how someone like this could truly survive life on life’s terms. Maybe this is what the author was going for – a reaction like no other? I try hard not to judge others, but Kristen judges every single person she comes in contact with, but not her role in the relationship, and it made me a little bitter. Perhaps this is something I need to work on myself. Note to self. Be warned, Kristen jumps around a lot in her text as a sort of real-time relay of her thoughts. It’s fragmented and at time difficult to follow. If you are a critical reader when it comes to formatting, you may want to pass on this book, although it’s worth a shot if you want some insight into the world of sobriety and interpersonal growth.